This article is about the location, now in the Greater London area, established in the 12th century. For the Parliament constituency, see Chipping Barnet (UK Parliament constituency). "Barnet, London" redirects here. For the borough, see London Borough of Barnet. Chipping Barnet or High Barnet is a market town in the London Borough of Barnet, England. Historically in Hertfordshire, it is a suburban development built around a 12th-century settlement, and is located 10 1⁄2 miles (17 km) north north-west of Charing Cross, east from Borehamwood, west from Enfield and south from Potters Bar. 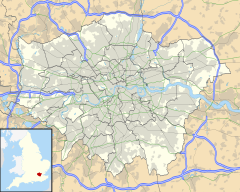 Its name is very often abbreviated to just Barnet, which is also the name of the borough of which it forms a part. Chipping Barnet is also the name of the Parliamentary constituency covering the local area – the word "Chipping" denotes the presence of a market, one that was established here at the end of the 12th century and persists to this day. Chipping Barnet is one of the highest-lying urban settlements in London, with the town centre having an elevation of about 427 feet (130 m). The town's name derives from an ancient settlement, recorded as Barneto c. 1070, Barnet 1197, La Barnette 1248, that is 'the land cleared by burning', from Old English bærnet, referring to the clearing of this once densely forested area in early times. It is also the site of an ancient and well-known horse fair, whence comes the rhyming slang of Barnet Fair or barnet for 'hair'. The fair dates back to 1588 when Queen Elizabeth I granted a charter to the Lord of the Manor of Barnet to hold a twice yearly fair. The famous Barnet Market is now (2018) nearly 820 years old. 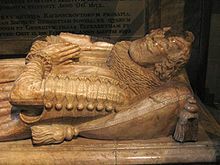 On 23 August 1199 King John issued a charter for a market at Barnet to the Lord of the Manor, the Abbot of St. Albans, John de Cella. Chipping Barnet was historically a civil parish of Hertfordshire and formed part of the Barnet Urban District from 1894. The parish was abolished in 1965 and the Chipping Barnet section of its former area was transferred from Hertfordshire to Greater London and the newly created London Borough of Barnet. In 1801 the parish had a population of 1,258 and covered an area of 1,440 acres (5.8 km2). By 1901 the parish was reduced to 380 acres (1.5 km2) and had a population of 2,893. In 1951 the population was 7,062. In Saxon times the site was part of an extensive wood called Southaw, belonging to the Abbey of St Albans. The name of the town appears in early deeds as 'Bergnet' – the Saxon word 'Bergnet' meant a little hill (monticulus). Barnet's elevated position is also indicated in one of its alternative names ('High Barnet'), which appears in many old books and maps, and which the railway company restored. The area was historically a common resting point on the traditional Great North Road between the City of London and York and Edinburgh. Barnet belonged to the County of Hertfordshire until 1965, when under the London Government Act 1963, East Barnet Urban District and Barnet Urban District were abolished and their area was transferred to Greater London to form part of the present-day London Borough of Barnet. At the beginning of the 21st century, a tongue-in-cheek movement calling for the name Barnet to be changed to "Barnét" began to gain the attention of the public and the national media, with many public road signs in the area regularly being altered to contain the accented character. Barnet Council has been treating any such alterations to public road signs as vandalism. St John the Baptist Church (built 1560), is a landmark for miles around and stands in what was the centre of the town, was erected by John de la Moote, abbot of St Albans, about 1400, the architect being Beauchamp. Playing on its antiquity, it continues to call itself "Barnet Church", although this is not an official title. It is in fact the parish church of Chipping Barnet only, whilst Christ Church is the parish church of High Barnet, St Mark's is the parish church of Barnet Vale, St James's is the parish church of New Barnet, and St Mary the Virgin is the parish church of East Barnet. The parish church of St Mary the Virgin, Monken Hadley (rebuilt 1494) also has parish boundaries that include a significant part of High Barnet, including much of Barnet High Street. The living of Barnet is a curacy, held with the rectory of East Barnet till the death of the last incumbent in 1866, when the livings were separated. The parish of Chipping Barnet, served by St John's Church, was provided with a chapel-of-ease in Victorian times; subsequently Chipping Barnet parish was split in two, and the chapel-of-ease (on Bells Hill, Barnet) raised to the status of a parish church, dedicated to St Stephen. Chipping Barnet is designated as a Neighbourhood Centre in the London Plan. The tower of Barnet parish church – St John the Baptist – at the top of Barnet Hill claims to be the highest point between itself and the Ural Mountains 2,000 miles (3,200 km) to the east. However, the same has been said of numerous other points. Since the opening of the railway, development has increased considerably, especially in the west of the area near Arkley. For a London town, Barnet lies very high. The High Street lies 427 feet (130 m) above sea level and the surrounding southern land no less than 295 feet (90 m). Chipping Barnet town centre is covered by the High Barnet ward. According to the 2011 census, the population was 82% white (68% White British, 11% Other White, 3% White Irish). Indians made up 4% of the population, and all black groups made up 3%. The whole town is defined as the Chipping Barnet parliamentary constituency, which takes up the eastern third of the wider borough. This data does not represent the town as a whole due to the fact that it contains six other wards. Barnet Hill is a major hill on the historic Great North Road. In coaching days, 150 stagecoaches passed through Barnet daily. The modern Great North Road replacement the A1 avoids the town along Barnet Bypass. High Barnet Underground station is on the Northern line while New Barnet railway station is on the East Coast Main Line served by services from King's Cross and Moorgate to Welwyn Garden City. Totteridge and Whetstone Underground station serves the affluent areas bearing the same name south west of High Barnet town centre. Oakleigh Park railway station serves the eastern extremity of the town. The Barnet Tunnel is also in the area. Barnet is served by Barnet Hospital, which is run by The Royal Free London NHS Foundation Trust as part of the English National Health Service. There is also an NHS clinic in Vale Drive (near Barnet Hill and High Barnet station). London Ambulance Service responds to medical emergencies in Barnet. Home Office policing is provided by the Metropolitan Police Service. Statutory emergency fire service is provided by the London Fire Brigade, which has a station on Station Road, built in 1992. Barnet FC is the local football team, currently in Football League Two, the fourth tier of English football – at the end of the 2012/13 season Barnet were relegated from League Two, but have regained promotion since. They played at the Underhill Stadium until 2012/13 but from the 2013/14 season are playing at The Hive Stadium in Stanmore in the London Borough of Harrow. They first reached the Football League in 1991 as champions of the GM Vauxhall Conference but lost their status 10 years later with relegation, only to return four years later – again as Conference champions. London Lions F.C. is also based in Barnet, near Stirling Corner, but the 1st team plays midweek and some cup home games at Hemel Hempstead Town F.C. as its own ground is not floodlit and does not meet the requirements for some cup competitions. There are a number of amateur football clubs based in Barnet including East Barnet Old Grammarians and Ravenscroft Old Boys. Barnet Cricket Club and Old Elizabethans' Cricket Club have merged to form one club in Barnet and currently play their games at Gypsy Corner. Shaftesbury Barnet Harriers is a local athletics club. Chipping Barnet has a King George's Field in memorial to King George V. Old Court House Recreation Ground is a park in High Barnet. Similarly to the cricket clubs, Barnet and Old Elizabethans rugby clubs merged to form Barnet Elizabethans RFC, playing in Byng Road, Barnet, near Queen Elizabeth's School. Cuisines on offer include Italian, French, Indian, Chinese and south east Asian. Amongst the most popular restaurants are branches of Melange, Pizza Express, and Prezzo. High Barnet also has a number of coffee/snack outlets, both independent ones such as The Coffee Bean, as well as branches of Starbucks, Carluccio's, Caffè Nero and Costa Coffee. The local newspapers are as of 2011, The Barnet and Potters Bar Times and Barnet Today. ^ "Chipping Barnet Ch/CP through time | Census tables with data for the Parish-level Unit". Visionofbritain.org.uk. Archived from the original on 6 January 2016. Retrieved 14 August 2015. ^ "Chipping Barnet Ch/CP through time | Historical Statistics on Population for the Parish-level Unit". Visionofbritain.org.uk. Archived from the original on 18 October 2015. Retrieved 14 August 2015. ^ "Friern Barnet". British-history.ac.uk. 10 August 2015. Archived from the original on 2 September 2014. Retrieved 14 August 2015. ^ "Middle-class mischief-makers add accent to Barnet sign to give it French twist". Daily Mail. 7 January 2008. Archived from the original on 24 July 2012. Retrieved 14 August 2015. ^ "Residents change road signs". BBC News. 3 January 2008. Archived from the original on 18 October 2015. Retrieved 26 April 2010. ^ "Barnet by any other name is 'irresponsible' (From Times Series)". Times-series.co.uk. Archived from the original on 18 October 2015. Retrieved 14 August 2015. ^ Services, Good Stuff IT. "High Barnet – UK Census Data 2011". UK Census Data. Archived from the original on 23 September 2016. ^ "Things to do in London, London Events". Spoonfed. 26 August 2010. Archived from the original on 14 January 2013. Retrieved 14 August 2015. ^ "Hot stuff as Barnet hosts Chilli Fiesta". Barnet & Whetstone Press. Archived from the original on 24 September 2015. Retrieved 14 August 2015. Wikimedia Commons has media related to Barnet Town. Wikisource has the text of the 1911 Encyclopædia Britannica article Barnet.